Wow! Location, location, location! 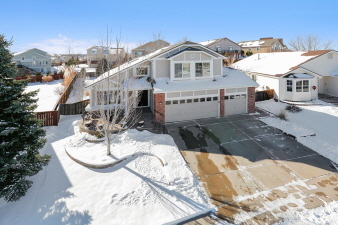 Rare opportunity to own in exclusive Carriage Club for under $600K! Home priced below comps for quick sale. Awesome main floor master including completely updated bath! Recently added sliding door is your private escape from master to the oversized trex deck & hot tub! Star gaze w/ steam rising as the snow gently falls in your private retreat. Kitchen completely redone to include granite plus extended counter peninsula, stainless, & custom designed walk-in pantry! Basement boasts of craft room, gym, & media room with stadium tiered seating, projector and large screen included. Quiet cul-de-sac ends to open/direct access on foot or bike to the Bluffs Regional walking/riding trails & WildCat Mountain Biking trail system w/ over 250 acres of open space. Easy access to I-25, Lincoln Light Rail Station, Charles Schwab campus, Sky Ridge Medical Center, DTC, Park Meadows Mall, & Lone Tree Golf course. Don't miss this unique opportunity!! !